Uglyworld #606 - The Muffin Man (168-365), originally uploaded by www.bazpics.com. Having just checked into my hotel in Marburg after an extremely long day of travelling and work the last thing I wanted to have to deal with was heading out for dinner, luckily Wedgehead came to the rescue and went out and brought us all back some dinner. 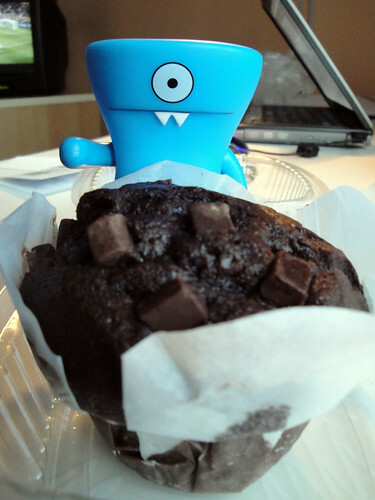 I spotted this muffin on the table while eating my sandwich from Subway, but the second I moved towards it Wedgie pointed out that he had been couped up in the car all day and he deserved the muffin all to himself.